Background: Irrational prescribing is a global problem. The present study was undertaken to identify the problem of irrational medicine use by Bachelor of Medicine and Bachelor of Surgery (MBBS) and Bachelor of Ayurvedic Medicine and Surgery (BAMS) doctors in outpatient setting, by using WHO prescribing indicators. Materials and Methods: This study was carried out in Vishrantwadi, Pune, India. 250 prescriptions were collected from MBBS doctors and 250 prescriptions were collected from BAMS doctors and their prescription pattern was analyzed using WHO prescribing indicators. Results: Average number of medicines per prescription was 2.4 for MBBS and 3.04 for BAMS doctors. 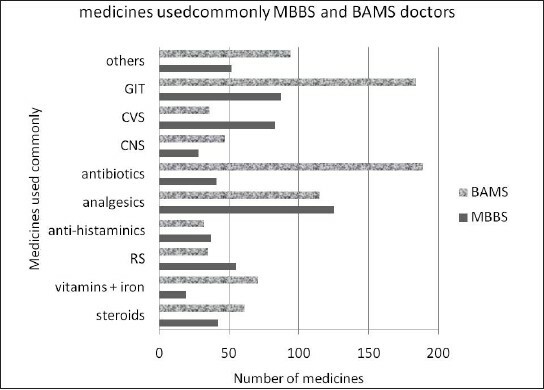 Percentage of prescriptions with antibiotics and with injections was significantly more in BAMS doctors. Antibiotics, gastrointestinal system related medicines, vitamins and iron preparations were prescribed more by BAMS doctors. Percentage of irrational fixed dose combinations prescribed by BAMS doctors was more (57.2%) as compared to MBBS doctors (28.6%). Conclusions: In the present study, although the prescribing patterns of both MBBS as well as BAMS doctors are not satisfactory; the BAMS doctors seem to prescribe more irrationally as compared to MBBS doctors. Large quantities of medicines are being sold in India. Apart from allopathic medicine doctors: Ayurvedic, unani, siddha, and homeopathic (AYUSH) doctors also play a significant role, particularly in health-care system of rural and slum in urban areas. Such medical practitioners use allopathic medicines for their patients instead of using medicines from their own course. In the absence of adequate training about allopathic medicines and their pharmacology in their curriculums, they lack proper knowledge of the allopathic medicines and their rational use. In this situation, the pharmaceutical companies influence such practitioners for the sale of their products. This leads to high-level of irrational use of medicines resulting in reduced treatment efficacy and contributing to problems like medicine interactions and higher prevalence of antibiotic resistance. Misuse of medicines occurs in all countries. The irrational practices are common and costly in developing countries. Such practices include polypharmacy, over use of anti-microbials and injections, use of wrong and ineffective medicines, underuse or incorrect use of effective medicines, use of combination products that are often more costly and offer no advantage over single drug products. Irrational use of medicines leads to decrease in the quality of drug therapy, wastage of resources, increased treatment cost, increased risk for adverse drug reactions and emergence of resistance. The World Health Organization (WHO) proposed core prescribing indicators for prescribing audit and drug utilization studies ., Rational use of medicines requires that patients receive medications appropriate to their clinical needs, in doses that meet their requirements, for an adequate period of time and at the lowest cost to them. The availability and affordability of good quality medicines along with their rational use is needed for effective health-care delivery. However, irrational medicine use is widely prevalent, especially in developing countries. Among AYUSH courses, only BAMS curriculum has allopathic Pharmacology in their syllabus. Unlike MBBS curriculum, it is not for one and half years. Hence, it could be predicted that they would have less knowledge of allopathic medicines in relation to their uses, adverse reactions, interactions, pharmacokinetics, and pharmacodynamics. The number of allopathic doctors in India is 668,131 and AYUSH doctors are 443,634. , Government officials claim that dearth of MBBS doctors in urban slums and rural areas has made inclusion of alternative medicine doctors in public-health programs unavoidable. As per WHO estimates, India has a deficit of 600,000 doctors. Replying to the issue of demand of homeopathic doctors to practice allopathy since there is shortage of allopathic doctors in rural areas, the minister said, "It was not possible legally to allow them to practice a medicine which they have not studied. Unani, homeopathy, and others doctors wishing to practice allopathy should study pharmacology for a full course of 1 year and they will be allowed to practice only after they clear the examination." Accordingly, Maharashtra Medical Practitioners Act, 1961 will be amended. BAMS and BHMS doctors quite often use modern medicines for various reasons but status regarding valid legal permission is ambiguous. Moreover, BAMS and BHMS doctors are working as paramedics and house doctors in private hospitals, including the so called intensive care units. The regulating bodies like Medical Council of India and Central Council of Indian Medicine have so far turned a Nelson's eye to this problem. The present study was undertaken to identify the problem of irrational use of medicines in an area in Pune city, India; by using WHO prescribing indicators to analyze the samples of outpatient prescriptions of MBBS and BAMS doctors. The present study was carried out in Vishrantwadi, Pune City, and Maharashtra, India. 250 left over prescriptions were collected from MBBS doctors and 250 BAMS doctors during March 2011 to November 2012. The left over prescriptions were collected from four chemist shops in Vishrantwadi area and WHO prescribing indicators ,[ 14] were used to assess the rationality of these prescriptions. The protocol was approved by institutional Ethical Committee of B.J. Govt. Medical College, Pune (approval number BJMC/IEC/Pharmac/ND-Dept 0312006-6). Average number of drugs per prescription = total drugs prescribed/prescriptions used. Percentage of drugs prescribed by generic name = total generic drugs prescribed/total drugs prescribed × 100. Percentage of prescriptions in which antibiotics were prescribed = prescriptions in which at least one antibiotic was prescribed/total prescriptions × 100. 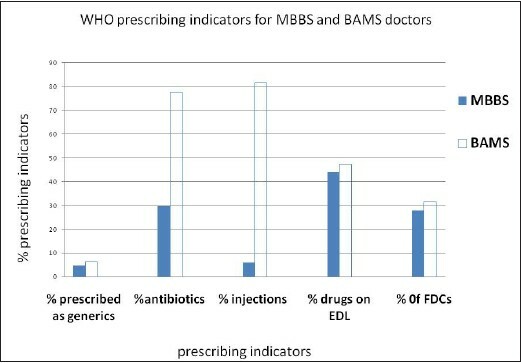 Percentage of drugs prescribed included in the essential medicines list  (EML) = total drugs prescribed included in the EML/total drugs prescribed × 100.
WHO prescribing indicators were calculated using a formula for each indicator. Statistical Analysis: for average medicines prescribed per prescription we used unpaired "t"-test and for other indicators we used Chi-square test. 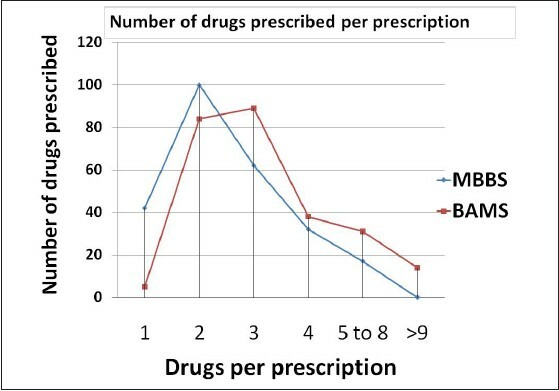 [Table 1] compares the prescribing patterns between MBBS and BAMS doctors. 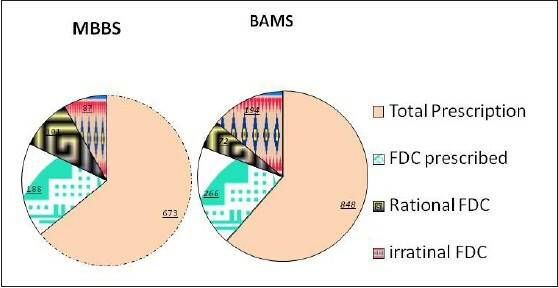 Percentage of prescriptions with antibiotics and injections were significantly more in BAMS doctors [Table 1] and [Figure 1], [Figure 2], [Figure 3], [Figure 4]. Less number of medicines per prescription was seen in MBBS doctors but it was not statistically significant. Antibiotics, GIT related medicines, vitamins, and iron preparations were prescribed more by BAMS doctors. The number of FDC prescribed by BAMS doctors was more as compared to MBBS doctors, but it was not stastically not significant. Prescribing medicines is an important part of clinical medicine. It not only reflects the physician's knowledge but also the expertise in diagnosis and attitude toward selecting most appropriate, cost-effective treatment. Hence, medicines prescribed by physicians should be continuously assessed and refined by doing prescription audit frequently. We found that some patients forget to collect their prescription back from the pharmacist. Such 2-3 prescriptions remain in the chemist shop daily. We decided to use these left over prescriptions since they reduce the bias. The bias is often seen in general prescription audits as the prescribers know that somebody is going to assess their prescriptions and hence become conscious. A study conducted in primary health-care facilities in the Irbid governorate, in northern Jordan for medicine use pattern showed that the mean number of medicines prescribed per prescription was 2.3 ± 0.9, percentage of medicines prescribed by generic name was 5.1%, percentage of prescriptions involving antibiotics was 60.9%, percentage of prescriptions involving injections was 1.2% and the percentage of EML medicines prescribed was 93%. Results of the Jordan study are comparable with MBBS doctors in our study for all WHO prescription indicators. However, the values in Jordan study are significantly less than BAMS doctors for all indicators except EML medicines prescribed. Prescription audit of secondary level government hospitals in Maharashtra gives the values of 2.85, 60%, 35%, 25%, and 46%, respectively, for medicines prescribed per prescription, generic name, antibiotics, injections and medicines prescribed from EML. After comparing these values with prescription pattern of BAMS doctors in our study, it becomes quite clear that the doctors of secondary level government hospitals prescribe more rationally. According to the studies carried out in Vellore  and Hyderabad;  nutritional products, vitamins, and analgesics were the most commonly prescribed drugs. The proportion of medicines of these categories was seen to be very high in the prescriptions of unqualified practitioners. In our study; antibiotics, GIT related drugs, analgesics, vitamins and iron preparations were prescribed more commonly. Lack of correct information: Majority of the practitioners rely on medical representatives for updating their knowledge. Hence incomplete knowledge, skills or information, unrestricted availability of medicines, overwork of health personnel, inappropriate promotion of medicines and profit motives from selling medicines. Poor communication between health professionals and patients: Doctors do not give adequate time to each patient and do not even explain the various facts that medicines take some time for onset of action; antibiotics are not required for viral infections, multivitamin injections are not necessary for normal healthy persons etc. Medical practitioners do not want to lose their patients because of perceived lack of effect of the medicine or its failure to treat a disease. Hence they keep on prescribing more medicines at a time. Demand from the patient: So as to satisfy the patient's expectations and demand of quick relief, some clinicians tend to prescribe a medicine for every single complaint. Problem based pharmacotherapy training in undergraduate curriculum. Strong regulatory mechanism to combat the irrational drug promotion strategies of pharmaceutical companies. The prescribing indicators recommended by WHO that are used in this study can measure the rationality of prescriptions in the case of general practitioners and primary health centers. However, their use in multispecialty hospitals and secondary or tertiary care centers is questionable as it includes the patients suffering from multiple diseases at a time. We feel that these indicators are inappropriate in such conditions as these patients generally need more 2-3 medicines at a time. Hence more efforts are needed to formulate the indicators that will be suitable for multispecialty hospitals and secondary or tertiary care centers. In the present study, although the prescribing patterns of both MBBS and BAMS doctors are not satisfactory, the BAMS doctors seem to prescribe more irrationally as compared to MBBS doctors. If government wants to continue with the practice of allowing Ayurvedic doctors to prescribe modern medicine; Pharmacology should become the mandatory part of their curriculum. To review the progress of Pharmacovigilance programs and suggest measures to strengthen the same. Authors would like to thank Dr. Anant Phadke (Peoples health movement) for his valuable suggestions for proper conduct of this study and Dr. Geeta Pardeshi (Assistant Professor PSM BJGMC, Pune) for her support in applying statistical tests for this article. 1. Jadeja J. Unethical medicine promotion: an emerging threat for Indian society, 2012. Available from: http://www.iegalserviceindia.com/articles/une.htm. [Last cited on 2012 Aug 25]. 2. Sharma P, Kapoor B. Study of prescribing pattern for rational drug therapy. Jammu Kashmir Sci 2003;5:107-9. 3. Ghimire S, Nepal S, Bhandari S, Nepal P, Palaian S. A prospective surveillance of drug prescribing and dispensing in a teaching hospital in western Nepal. J Pak Med Assoc 2009;59:726-31. 5. Potharaju HR, Kabra SG. Prescription audit of outpatient attendees of secondary level government hospitals in Maharashtra. Indian J Pharmacol 2011;43:150-6. 6. Ambwani DS, Mathur AK. Rational medicine use. Health Adm 2005;19:5-7. 7. Hogerzeil HV. Promoting rational prescribing: An international perspective. Br J Clin Pharmacol 1995;39:1-6. 8. Dendrytes.com, Health workforce in India, World Health Organization; 2007. p.16. 9. Kunnathoor P. Maharashtra Govt's plan to allow AYUSH doctors to practice allopathy may be challenged, 2012. Available from: http://www.pharmabiz.com. [Last cited on 2012 Jul 17]. 11. Maharashtra Medical Practitioners Act, 1961**, Maharashtra Act No. XXVIII of 1961, Ch. 1, Preliminary, Definitions, Clause II Page 2. 12. Kshirsagar MJ, Langade D, Patil S, Patki PS. Prescribing patterns among medical practitioners in Pune, India. Bull World Health Organ 1998;76:271-5. 13. Gupta N, Sharma D, Garg SK, Bhargava VK. Auditing of prescription to study utilisation of antimicrobial in tertiary hospital. Indian J Pharmacol 1997;29:411-5. 14. Santos Vd, Nitrini SM. Prescription and patient-care indicators in healthcare services. Rev Saude Publica 2004;38:819-26. 15. WHO model list of essential medicines 16th list (updated) March 2010, WHO medicines website 2012 Aug 5. Available from: http://www.who.int/medicines/en/index.html [Last cited on 2012 Aug 5]. 16. Draft guidelines for registration of fixed-dose combination medicinal products, multisource (generic) pharmaceutical products: Guidelines on registration requirements to establish interchangeability, special considerations Available from: http://www.who.int/medicines/organization/qsm/expert_Committee/Guidelines/FDC-WHO-QAS04_108, Working document QAS/04.093/Rev.4 [Last accessed on 18 May 2012]. 17. Panda J, Tiwari P, Uppal R. Evaluation of the rationality of some FDCs: Focus on antihypertensive drugs. Indian J Pharm Sci 2006;68:649-53. [Last cited on 2013 Feb 11]. 18. Otoom S, Batieha A, Hadidi H, Hasan M, Al-Saudi K. Evaluation of drug use in Jordan using WHO prescribing indicators. East Mediterr Health J 2002;8:S37-43. 19. Krishnaswamy K, Kumar BD, Radhaiah G. A drug survey - Precepts and practices. Eur J Clin Pharmacol 1985;29:363-70. 20. Anant Phadke and S. Medico friend circle, Strengthening the Drug Regulatory Mechanism in India Draft Note for the Working Group on Medicines and Food Regulation for giving inputs for the 12th Five Year Plan, July 2011 available from: http://www.mfcindia.org/main/bgpapers/bgpapers2012/am/bgpap2012c.pdf [Last accessed on 2013 Mar 08]. 22. Gautam CS, Aditya S. Irrational medicine combinations: Need to sensitize undergraduates. Indian J Pharmacol 2006;38:169-70. 23. Chareonkul C, Khun VL, Boonshuyar C. Rational drug use in Cambodia: Study of three pilot health centers in Kampong Thom Province. Southeast Asian J Trop Med Public Health 2002;33:418-24. 24. Francis PA. The schedule HX. Available from: http://www.Pharmabiz.com [Last accessed on 2011 June 29].